Lift up the shattered spirits of your loved ones and restore their faith in life. Send your sincerest sympathies with this gift package priced within budget at only $88. 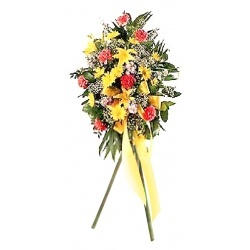 It consists of white orchids, mums and carnations of only the freshest, choicest quality, displayed elegantly in a bamboo that stands approximately 7 feet tall. Orchids symbolize love, beauty, and refinement. 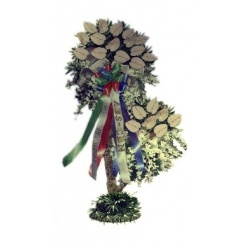 This gift package is ideal for occasions for Sympathy. Your loved ones who are in mourning can spring back to passionate living with a gift of upliftment and inspiration. 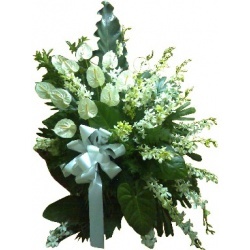 Send your earnest sympathies with this gift package priced reasonably at only $78 It consists of 1 dozen anthuriums and orchids of only the freshest, choicest quality, arranged elegantly on a basket. Soothe the grieving hearts of your loved ones and renew their confidence in life. Send your heartfelt sympathies with orchids for love and beauty and anthuriums for the heart. Priced within budget at only $85, this gift package consists of only the freshest, select-quality 1 dozen anthuriums and 2 dozen orchids in a bamboo that stands approximately 8 feet tall. Help loved ones survive a profound loss with a gift of anthuriums, flowers of the heart, and mums for hope. Send your deepest sympathies with this gift package at an affordable price of only $78. It consists of only the freshest anthuriums, orchids and mums of superior quality, arranged elegantly in a bamboo that stands approximately 7 to 8 feet tall. Loved ones who are grieving can more easily regain their belief in life when showered with assurances and affection. Send your sincerest sympathies with this gift package at an affordable price of only $85. It consist of only the freshest, select-quality liliums, carnations, and mums arranged elegantly in a bamboo that stands approximately 8 feet tall. Nourish the dampened spirits of your loved ones with the optimism of flowers to renew their passion for life. 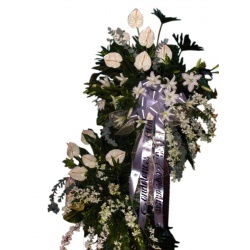 Send your earnest sympathies with this gift package which includes 2 layers of driftwood that stand elegantly, consisting of orchids, anthuriums, gerbera, lisianthus, and mums of only the freshest, choicest quality, all priced reasonably at only $85. 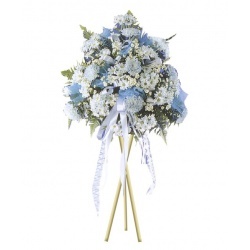 Appease the mournful hearts of your loved ones who have suffered a great loss and inspire them with flowers. 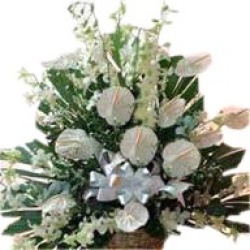 Send your heartfelt sympathies with this gift package which includes 1 layer of driftwood that stand elegantly, consisting of only the freshest, select-quality anthuriums all at a reasonable priced of only $65. Aid your loved ones in finding the strength to confront a significant loss by encouraging them with flowers. 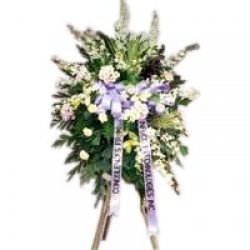 Send your deepest sympathies with this gift package priced within budget at only $95. 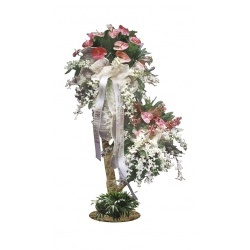 It consists of orchids and anthuriums of only the freshest, choicest quality, arranged elegantly in 2 layers driftwood that stand approximately 9 feet tall. Help your loved ones endure a powerful loss with a gift of carnations that signify pure love, innocence, and remembering, and roses that symbolize love, courage, and respect. Send your sincerest sympathies with this gift package priced affordably at only $88. 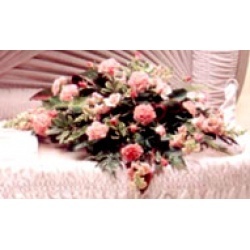 It is an endearing flat spray arrangement of only the freshest, premium-quality carnations and roses. Guide your mournful loved ones through a difficult time of facing a valuable loss and revive their weary spirits with liliums. Send your earnest sympathies with this gift package that goes for an affordable price of only $85. Consist of white orchids arranged on a stand. Nurture the drained spirits of loved ones in mourning and rejuvenate their faith in life. Send your heartfelt sympathies with orchids for love and beauty, liliums for innocence and purity, and anthuriums for the heart. At a budget-friendly price of only $75, this gift package is a flat spray arrangement of orchids, liliums, and anthuriums of only the freshest, choicest quality. A standing arrangement of 3 dozen orchids approximately 7ft tall. A standing arrangement of anthuriums, birds of paradise and malaysian mums, approximately 7 ft tall. A basket arrangement of white mums and orchids. A standing arrangemnt of 2 doz white mums in a bamboo stand, approximately 7 ft tall. A driftwood standing of orchids and anthuriums arranged elegantly in a 2 layer stand approximately 8 to 10 ft tall. A standing arrangement of orchids,anthuriums, and liliums in a driftwood stand approximately 8 - 10 ft tall.